I'm going to give you the low down on this last one. I know I get a little frustrated coming across natural ideas on the Internet, and never getting a true picture of how difficult the natural undertaking is. So this is going to be an honest take on natural egg dyeing. And I feel good about saying what I'm about to say because I LOVE the outcome. The eggs are beyond beautiful. They are gorgeous. If I could equate the man of my dreams to the perfectly all-natural dyed egg, this would be it. Here's the disclaimer, it's a bit of work, and it will create a mess. I don't like messes. But I didn't mind this one, one bit. I gave yesterday up, I gave it up to the kitchen, and to the celebration, and to the process. I ended up in my husband's boots and my pajama pants, and a sweatshirt, in the backyard, that was oh-by-the-way semi-covered in snow, throwing the discards of the dyeing project in our garden area. And I'm willing to do it again next year, albeit lessons learned. So what are my lessons? Numero uno - prepare dye and hard boiled eggs a day or so ahead of dyeing day. Feel free by all means to engage the kids in the process, but realize too that it will be like bits and pieces of the process. Because THE WHOLE PROCESS takes a small investment of time, and we all know how kids are. Numero dos - use a combination of white and brown eggs. My daughter wan't pleased with the outcome because none of the eggs were "easter colored" (we used all brown eggs). What?! Yes, none of the eggs were pastel pink, orange, yellow, green, or blue. They were gorgeously mottled earth tones. Ah, the young ones. Numero tres - use your tried and true method for hard boiling. We used a new steaming method that over cooked the eggs a bit. I just today came across the oven-baked method (12 eggs in a muffin tin for 30 minutes in 325 degrees, and then shock them in ice water afterwards). I'll be trying this one soon, as we eat eggs around the clock in this house. The green-gray edging on the yolk is a sign of being slightly overcooked, and it was indeed a bit chalky and hard to get down. But I'll still eat them!! Numero quatro - think about vegetables, what they'll simmer down to in water, color-wise, in order to plan your colors. 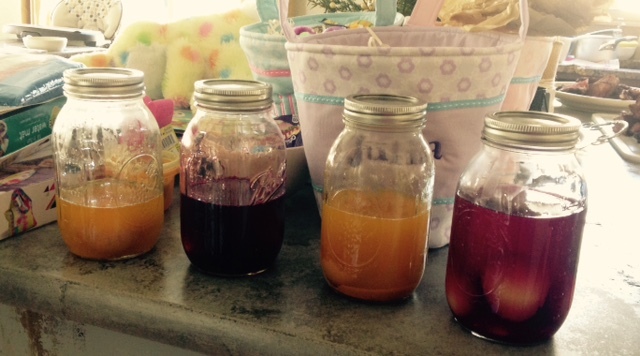 We did four: red beets, yellow beets, turmeric, and purple cabbage. The yellow beets were a bust on the brown eggs, so those went into the red beet jar for a second dye. My favorite? The purple cabbage. On brown eggs, we ended up with robin egg blue and moss green. Plus I'm using half the cabbage for a side salad with dinner one night this week. One little head made a ton of shredded cabbage. Turmeric turned the brown eggs a gold color. Really elegant.